The best way to help your family on its way to a healthier life is to lead by example in fitness and exercise. No-one in the family is going to listen to you if you are simply shouting instructions at them rather than practising what you are preaching. Why would a teenager go out and do some sport because mum or dad says so, if mum and dad spend evening after evening in front of the TV. Therefore, lead by example and your offspring and spouse will be far more encouraged to do the same. The first thing to do when setting this example is to make small changes to your lifestyle which suggest a healthier outlook on life. This could be leaving the car at home when only going a short distance and walking instead. Or you might get everyone to go out for a Sunday afternoon walk instead of collapsing in front of the TV after dinner. This can also extend to your diet. If you do not want your children to sit and eat bars of chocolate, then do not do it yourself. If you think your spouse is drinking too much, then lead by example and do not get into the habit of opening a bottle of wine every night. While it is important for all the family to find activities which they enjoy, if you truly want to lead by example, you should take up a sport or exercise activity that all the family may enjoy. That way, if they see you coming back from a training session or class having enjoyed it, they may be more inclined to go along with you the next time. But if, for example, you choose yoga, your husband and teenage son may not give a second thought to going along with you. If you are to have any hope of getting your family fitter and more active, you cannot afford to treat exercise as a chore. Your family must see that you enjoy what you are doing. Therefore, if you feel down or unwell and unlike exercising, do not force yourself to do it, as you may well end up making yourself feel worse. But when you are feeling good and the endorphins have been released into your bloodstream, make sure your whole family know about it and sees how much you are enjoying your exercise. When they see your glow that comes from exercise, they are bound to be intrigued and enticed into giving it a go themselves. 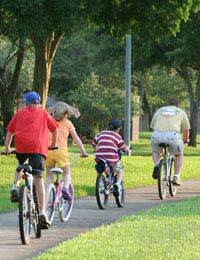 If your family are reluctant exercisers then leading by example is the best route to go down. While people who are active already may not take any notice if someone with a sedentary lifestyle asks them to exercise, someone with a similar lifestyle is bound to wonder why they should bother. But show them actual and tangible benefits to exercising and they will rush to join you.